Judgment Day was a 1997 limited series from Awesome comics. It was written by Alan Moore with art by Rob Liefeld, Gil Kane and many more. It was intended as a reboot of the Awesome characters created by Liefeld as part of the Image Comics line in 1992. The series dealt with the consequences of a murder in the super-hero community and the implications of the investigation that followed. 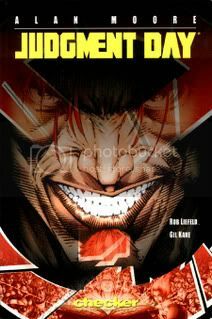 The three issues and the subsequent Judgment Day: Aftermath were collected in a Checker Books trade paperback in 2003. These annotations cover some of the characters in the Awesome universe many of whom were clearly influenced by classic comic book stories. Updated 14th November. Lou Mougin emailed me with several references that I had missed or struggled with. Excellent stuff, please keep them coming. Numbering: There are no page numbers in the Checker books trade paperback collection. I intended to just count pages but that got confusing so it seemed easier to restart the numbering for each chapter which equate to the issues of Judgment Day and the chapters in Judgment Day: Aftermath. I call the right hand page with the chapter title page 1 for each chapter. Page 2, panel 1. This is Mickey Tombs aka Knightsabre who first appeared in Youngblood #6. Page 2, panel 3. Sentinel appeared in Youngblood #1. Page 5, panel 1. The Brimstone Kid resembles several masked western heroes including the Two-gun Kid and the Outlaw Kid. Obviously his copper coloured horse and Native American companion suggests the Lone Ranger. Page 5, panel 2. His companion Nighteagle may be inspired by Tonto and the Standing Bear version of Super-Chief. Kid Thunder's name may be based on the first Johnny Thunder, his costume resembles the Phantom Rider. However neither of those characters were African-American. The best known African-American western hero is Lobo. Page 6, panel 1. The Lonesome Rider is a probable reference to the Lone Ranger. Page 9, panel 1. Vogue and Badrock appeared in Youngblood #1. Masada first appeared in Supreme #4. Page 10, panel 2. Riptide also appeared in Youngblood #1. Page 13. Bram the Berserk is obviously based on Robert E. Howard's Conan the Barbarian who appeared in several books including Conan the Conqueror and Conan the Freebooter. Wotan is the Germanic version of the Norse god Odin. Update: Derek (aka Rogue Jupiter) emailed me to mention Bram's similarity to two other characters: Kull of Atlantis and Bran Mak Morn, both of whom were also created by Robert E. Howard. Page 14, panel 3. The Frost Giant's Daughter was one of Howard's original Conan stories. Moore samples from Conan's history to create a back-story for Bram. Page 14, panel 3. Magnar Teufulsun appears to be based on one of Conan's arch foes Thoth-Amon, who was usually depicted in comics wearing a helmet with curved horns. Teufel is German for devil as Bram's warriors point out. I suspect that Moore is NOT referring to the Decepticons' base when he places Teufulsun in the Fortress Sinister. The blue furred Bartelmew is better known to Youngblood readers as Troll. Page 17, panel 2. Shaft was the nominal leader of Youngblood and also appeared in issue 1. Page 19, panel 1. Battlin' Baron and his Roarin' Roughnecks are counterparts of Sgt Fury's Howling Commandos. Other comic equivalents: The Iron Cross may be based on Enemy Ace; the Stormbirds are the Blackhawks; the Super-Patriot is an Image comics' character created by Erik Larsen. and Agent America is a Captain America or Fighting American analogue created by Rob Liefeld. Page 19, panel 2. The Phantom Aviator may be based on a comic-book aviator hero called the Phantom Eagle. Shamrock is Battlin' Baron's equivalent of Nick Fury's loyal number two Dum Dum Dugan. Page 20, panel 1. The young soldier detailed to stay with the Phantom Aviator may be the Roughnecks' equivalent of Junior Juniper from the Howling Commandos. Page 20, panel 2. As we discover later John Prophet might be based on Doc Savage the Man of Bronze. Page 21, panel 2. Savage Dragon was created by Erik Larsen and featured in one of the first comics in the Image launch of 1992. Page 22, panel 3. Diehard was one of the original line-up of Youngblood and appeared in issue 1. Page 22, panel 4. Diehard refers to his encounter with some old allies which occurred in Alan Moore's revamp of Supreme in the Story of the Year storyline. Moore retconned a JSA/JLA analogue super-team called the Allies which included the Diehard. Page 23. Zantar is clearly an analogue, and anagram, of Tarzan. Edgar Rice Burroughs' jungle lord first appeared in Tarzan of the Apes in 1912. Tarzan's parents were killed by a Lion and he was raised by Great Apes. Moore has reversed that origin as well as the name to have Zantar raised by white lions. Xanthea the Immortal Queen of the Silver City is probably a reference to Ayesha the immortal Queen from H Rider Haggard's novel She. Page 24, panel 2. This is the skeleton of Zantar's uncle Sir Edward Conqueror who is based on Arthur Conan Doyle's Professor Challenger. Page 24, panel 3. The designs of the natives' masks here and on the preceding pages may include some artistic jokes that I have missed. Page 25, panel 1. Supreme makes his first appearance here. Created by Rob Liefeld and Brian Murray and later rebooted by Moore. His Suprematons are the equivalent of the silver-age Superman's decoy robots. Optilux is Supreme's version of Brainiac. The Citadel Supreme or Floating Fortress is obviously based on Superman's Fortress of Solitude. Page 25, panel 2. Professor Night is the Supreme universe equivalent of Batman. I don't recall Lady Day cropping up in the Supreme comics but her real identity of Shona Shane suggests she is inspired by the Kathy Kane Batwoman. Toby Tyler is the Fisherman's sidekick Skipper which makes him Speedy to the Green Arrow. Page 27, panel 4. In Supreme speak Doc Rocket equals the golden-age Flash and Alleycat was a Black Canary/Catwoman amalgam. Page 28. Sentinel comments that he has barely heard of half of these old guys which is perhaps not surprising in view of Moore's Supreme retcon, although in the context of the Judgment Day storyline he must be lieing. Page 29. The Winter Knight is the Awesome universe equivalent of the Shining Knight, possibly with an added pinch of Marvel's Black Knight. Page 30, panel 1. The Shining Knight's horse is called Victory, I'm not aware if his sword had a name although the Black Knight wields the Ebony blade. Page 30, panel 2. Faralanx may just be a generic dragon unless someone can enlighten me further? Page 32, panel 1. Supreme has a "Mythopoeic Zoo". The Giant Gorilla is Stupendo the Simian-Supreme who is Supreme's version of Titano the super-ape, the Hell of Mirrors may equate to the Phantom Zone. Page 32, panel 3. The mermaid is based on Lori Lemaris although in the Supreme stories the mermaid became an angel called Luriel. Page 33. In the centre is Knightsabre with Toby Tyler, Shaft and Sentinel. Around them clockwise from bottom left are Badrock, the Fighting American, Polyman (Elongated Man/Plastic Man), the Fisherman (Green Arrow), Glory (Wonder Woman), Savage Dragon, Professor Night, Supreme, the SuperPatriot, Spacehunter (Martian Manhunter), and Kodiak and Dash of the New Men (I think). Page 2, panel 1. Shaft, the Super Patriot, Glory, Professor Night, Spacehunter, Badrock, Mighty Man (Shazam Captain Marvel), Sentinel, Maximage & Supreme. Page 3, panel 4. The audience or jury appears to include the Silver Surfer, the Thing and She-Hulk? Page 5, panel 2. In appearance Major Blake Baron appears to be based on one of the members of DC comics' Trenchcoat Brigade, possibly Doctor Occult who was also a member of a paranormal group known as the Sentinels of Magic. However his past as Battlin' Baron makes him a Nick Fury equivalent with the Veil as an occult version of SHIELD. Lou Mougin emailed me to point out that Nick Fury appeared in the 1960s Marvel comic Strange Tales along with Doctor Strange, and that Alan Moore is making another of his thematic jokes by merging the two dissimilar characters. Page 5, panel 3. Savage Dragon is possibly referring to the events at the end of the Supreme Story of the Year arc. Page 6, panel 1. I'm afraid I don't recognise the two characters in the middle of this panel. Email me if you do. Page 6, panel 1. I think the three characters in front of Badrock are the New Men Dash, Bird or Exit, and Reign. Page 7. Glory is obviously the Wonder Woman analogue. Her full name is given as Princess Gloriana Demeter compared with Princess Diana who becomes Wonder Woman. Glory was created by Rob Liefeld for Image comics. Page 8. Wonder Woman's mother was Hipolyta of the Amazons from the island of Themyscria. Glory's mother was the Greek Goddess Demeter from Ultima Thule which is a mythical island that appears in Greek writings. Demeter holds the Cornucopia, or horn of plenty. Yggdrasil, the world tree is from Norse mythology. Page 9, panel 2. Hermes was the Greek god of travellers and athletes. His winged helmet was the inspiration for the original Jay Garrick Flash. Hermes also wears his winged sandals and holds the Caduceus staff. Page 12, panel 1. We'll meet Storybook Smith later. Page 13, panel 1. Giganthro appears to be based on Anthro the first boy, a character who appeared in DC Showcase comics. Anthro has recently shown up in the Final Crisis event. Page 13, panel 2. Giganthro is accompanied by Zayla Zarn from the 25th century. Zarn is based on Imra Ardeen aka Saturn Girl from the Legion of Super Heroes in the 30th century. Zarn leads the LSH analogue the League of Infinity which was created by Alan Moore as part of the Kid Supreme retcon in his Supreme stories. Page 13, panel 3. The Miocene period ran from 25 million to 5 million years ago! Page 14, panel 1. Dino-Man may be based in part on Jack Kirby's Devil Dinosaur. Page 15, panel 4. Giganthro encounters the other members of the League of Infinity for the first time: Witch Wench, Wild Bill Hickok, Zayla Zarn and Achilles. Page 16, panel 2. Troll refers to Judy Jetson the teenage daughter from the cartoon family The Jetsons. Page 16, panel 3. This is Radar, the Hound Supreme, an obvious equivalent of Krypto the Super Dog. Page 19, panel 1. The last of Robert E Howard's novels about Conan the Barbarian was called The Hour of the Dragon. It is appropriate that Bram the Berserk heads towards his end against a Frost-Wyrm. Page 20, panel 2. In the Marvel universe the original Black Knight was Sir Percy of Scandia. The first DC Shining Knight was Sir Justin. Page 21, panel 3. The Black Knight's Ebony Blade had several powers but not the ability to freeze water. Moore combines legends again because being frozen in ice was the fate that befell the Shining Knight and brought him from King Arthur's time to the modern world. Page 22, panel 2. The Black Corsair is probably based on DC's Black Pirate, whose ghost was a notable supporting character in James Robinson's Starman series. Page 23, panel 1. Maximage appeared in a seven issue Image comic series of the same name. Her costume here is notably less revealing than her Rob Liefeld designed outfit of the 90s. Her appearance and powers owe something to both Marvel's Scarlet Witch and DC's Zatana. Dr Mystic was the original name of DC's Doctor Occult. If anyone has spotted the Eddy Saint reference please let me know. See Chapter three for more about Eddie Saint. Page 23, panel 2. As already mentioned Nighteagle may be based on DC's Super-Chief. Page 24. I need some help with Deliverance Drue who must be based on an established comics character but not one I know. He does have some elements of the Jonah Hex character. Update: Derek kindly emailed me to point out that Drue is probably based on Robert E. Howard's puritan adventurer Solomon Kane. The wikipedia page about Kane suggests that Derek is spot on and once again demonstrates Alan Moore's wide reading and love of the pulps. Page 28, panel 3. Dr Daniel 'Blacky' Conqueror is the leader of the Conquerors of the Uncanny based on DC's Challengers of the Unknown who were created by Jack Kirby and led by Kyle 'Ace' Morgan. Moore has cleverly mixed the Challengers with a dash of Conan Doyle's Professor Challenger from The Lost World stories. Page 29, panel 1. And here is Sir Edward Conqueror standing in for Professor Challenger and going up against a Lost World Dinosaur. Page 29, panel 3. More literary splicing as Moore makes Conqueror the brother of Tarzan's father. Page 30, panel 3. John Prophet, the Man of Marble is revealed to be a version of the pulp hero Doc Savage, the Man of Bronze. Page 31, panel 4. Moore makes some ironic comments about super-hero costuming and physical attributes in the 90s. Page 32, panel 2. Alexander Graves was the executive director of the Youngblood group but also a human personification of Lucifer?! He was also Knightsabre's father. This is also our first encounter with Storybook Smith. There does not seem to be a direct equivalent of this character in the DC universe and certainly not in the original JSA. However I'm sure I can remember a British comics hero who could bring storybook characters to life. Please email me to remind me. Update: Derek points out that Storybook Smith may actually be based on Johnny Thunder from the JSA and his wish granting "thunderbolt" genie who lived in Johnny's pen for a while. Derek also notes Smith's similarity to the original Kid Eternity who could summon historical and mythological characters to help him fight evil. Moore introduced Smith in issue 43 of Supreme in October 1996 and Judgment Day started in June 1997. As ever Alan Moore knew the score. Page 8, panel 2. A group of occult comic characters joining hands around a table can also be seen in Moore's Swamp Thing #50. Page 8, panel 3. Jack O'Lantern is the analogue of the original Spectre when he was more super-hero than agent of God. Page 11, panel 1. From left to right are Doc Rocket, Supreme, Jack O'Lantern, Black Hand, Glory, Storybook Smith, Mighty Man, Alley Cat, Professor Night, the Waxman & Roy Roman. The Waxman aka Waxy Doyle is based on the Wesley Dodds Sandman, and Roy Roman the Mer-Master is Aquaman but Lou Mougin made me slap my forehead by correctly pointing out that Roman spelt backwards is Namor, Marvel's Sub-Mariner. Alan Moore's jokes often have multiple layers. Page 12, panel 3. The prank occurred in issue 43 of Supreme with the Allies pretending to be their waxwork equivalents in Supreme's citadel museum. Page 12, panel 6. Rene Magritte's The Treachery of Images is on the wall in Smith's apartment. Considering what Moore is doing to the history of graphic storytelling here this seems an appropriate title. Page 13, panel 2. Detective Gorilla is Detective Chimp possibly with a dash of Sam Simeon as well. Page 13, panel 3. Maila Nurmi played the character Vampira who hosted TV horror shows and notably appeared in Ed Wood's Plan 9 from Outer Space. Page 21, panel 1. This image seems to be based on the cover of The Dark Knight Returns. Moore is commenting on the changes wrought on comics by Frank Miller and by himself. A little Watchmen reference might have been interesting as well. Page 21, panel 2. "Heroes motivated only by money or psychopathology stalked a paranoid, apocalyptic landscape of post-nuclear mutants and bazooka wielding cyborgs" is a reasonably accurate description of comics in the late 1980s and early 90s, including Image themselves! Page 26, panel 1. Suprema is the Supreme version of Supergirl. Page 28, panel 2. This must be the mysterious John Prophet? Page 6, panel 3. The Sylvia Plath book is called Johnny Panic and the Bible of Dreams. Page 1 (first page of story). The framing sections of this chapter are a tribute to Gil Kane and other classic comic creators. Kane, Jack Kirby and Wally Wood all get mentioned on this page. The Fighting American aka Nelson Flagg is an obvious Captain America analogue. Page 2, panel 3. John Broome and Gardner Fox were comic writers and editors. Page 4, panel 3. Twilight refers to Hulver Ramik, a version of Kanjar Ro who enslaved the Allies in one of the back-story retcons in Moore's Supreme: The Story of the Year. Kanja Ro appeared in Justice League of America #3. Page 15. The New Men were an Image comics team with some similarities to the X-Men. They had a five issue mini-series in 1994. From the top are Kodiak, Reign, Byrd & Exit. Page 16, panel 1. The fifth member of the New Men was Dash. Moore continues to mine DC's history: Carson Cave is a reference to Cave Carson from DC Showcase comics. Page 19, panel 3. The names refer to Fin Fang Foom and possibly Voltron. Page 22. Note: most of the references in this story about magical comic-book characters were provided by Lou Mougin. Just about everything that follows is his work. Thanks, Lou. The house resembles Doctor Strange's Sanctum Sanctorum but here in San Francisco and not Greenwich Village, New York. Lei-Ling is similar to Strange's assistant Wong. Other occult characters mentioned include Eddie Saint (again), Della Psychic and Stephen Hush. Lou Mougin suggests that Eddie Saint may take his name from the Leslie Charteris character The Saint. Della Psychic is based on the DC comics character Rose Psychic who appeared in the Doctor Occult stories. Her first name may refer to Perry Mason's secretary Della Street. Eddie Saint's title The Third Eye refers to the mystical concept of the same name. Page 24, panel 1. Lou Mougin notes that Della Psychic's thought-balloon about Owsley probably refers to a high-powered form of LSD which was mentioned in Tom Wolfe's book The Electric Kool-Aid Acid Test. Gate Park would be the Golden Gate park in San Francisco where the Human Be-In was held in 1967. “Need help against Qelepu or the Mauve Zone will be opened…” Lou also points out that the Mauve Zone refers to the Purple Dimension from a Doctor Strange story which was also referenced by Tom Wolfe. Qelepu is presumably Eddie Saint's version of the dread Dormammu. So from left to right in panel 1 we have Merlin, Nighteagle. the Alembic, Lori Saunders, Della Psychic & Eddie Saint. Page 25, panel 7. This magician refers to John Dee and Edward Kelley both real people who experimented with, or researched into, alchemy and magic. The Red Powder was a chemical that Kelley claimed allowed him to transmute lead into gold. John Dee has turned up in numerous works of fiction including Alan Moore's Promethea. Page 25, panel 8. A reference to a Mr. Hush. Just possibly this could refer to the mysterious Mr John Hussy who assisted John Dee and Edward Kelley in the alchemical experiments. Page 26, panel 3. Moore crosses the Miskatonic university from H.P.Lovecraft's stories with the DC universe Arkham asylum. In the books the Miskatonic university was located in the Lovecraft town of Arkham. Page 27, panel 2. Supreme's alter ego Ethan Crane works for Dazzle Comics in his version of Metropolis. Diana Dane is his Lois Lane equivalent. Page 28, panel 1. J'onn J'onzz the Martian Manhunter used his shapeshifting powers to masquerade as detective John Johns. His telepathic powers allowed him to communicate in many languages. Page 29, panel 3. The Allies Asteroid is their version of the JLA Satellite. Page 29, panel 2. Florax is based on Starro, the very first opponent of the JLA. Page 30, panel 1. Hulver Ramik is Kanjar Ro. Prismalo may be based on Despero. Page 30, panel 4. Lou Mougin quite rightly corrects me, Magno is not based on Mongol but instead refers to Amazo and android that battled the JLA with their own powers. Page 31, panel 2. Glory appears to be fighting an equivalent of Felix Faust. Page 32, panel 1. Wonder Woman's long time love interest is Steve Trevor. Page 32, panel 2. The Martian Manhunter's long lost Martian wife was called M'yri'ah. Superman's underwater love interest was Lori Lemaris the mermaid. Page 32, panel 4. See what happens if you don't use the vacuum cleaner? Page 36, panel 1. Lou Mougin points out that this creature may be a version of the Martian Manhunter's sidekick Zook. Something of the look of Spacehunter and his bird-like companion also suggests the Falcon and Redwing. Page 39, panel 4. Archie Goodwin. Page 40, panel 4. Lou Mougin made another good catch here. The tale that portrayed Gil Kane as a prisoner in an imaginary realm was called "His name is ... Kane!" and appeared in House of Mystery #180. The story was written by Mike Friedrich with art by Kane and Wally Wood and showed Gil Kane being trapped in his own artwork. The title and the last line of this chapter were a reference to another classic Gil Kane book "His name is... Savage!"